For this week's Image of the Week I'm taking a dip into my archive - literally! 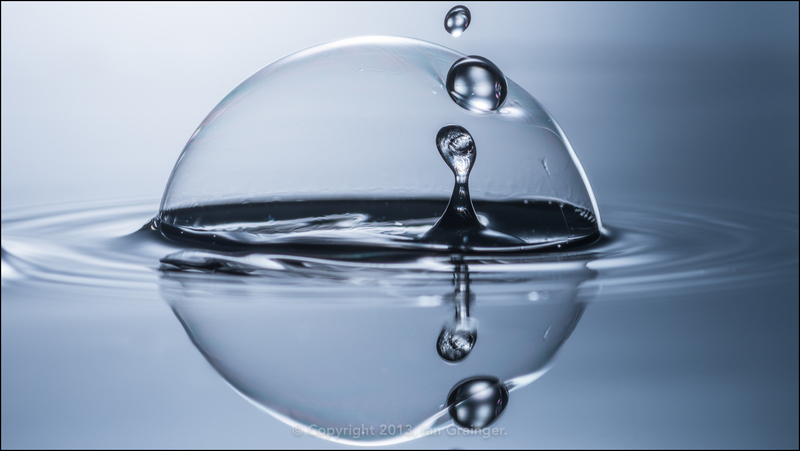 The main image above, Shields Up, was captured by blowing soap bubbles onto the surface of the water and then trying to time the shutter as the falling water drop breached the bubble. I remember that it was insanely difficult to time correctly, and that this image was the result of a few hundred attempts! I was very pleased that my luck and hard work paid off when Shields Up won the #wexmondays weekly Twitter competition held by the photographic store Wex Photographic. 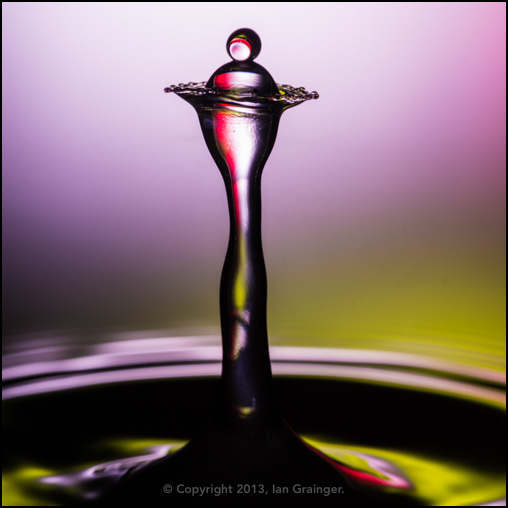 With Balancing Act, I was experimenting with using different coloured gels on my flash guns. 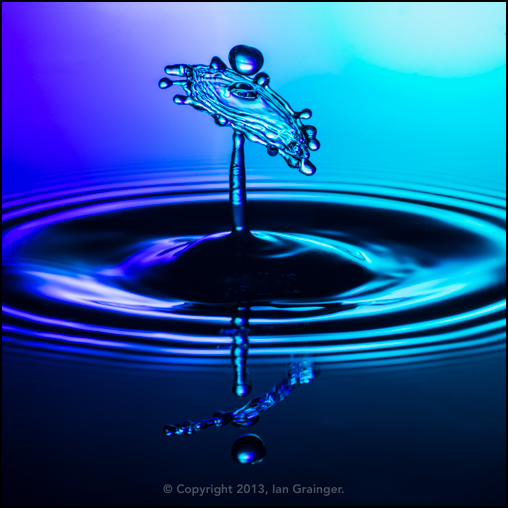 I have literally thousands of water drop images in my archive, many of which are similar in size and shape, however, this is the only one I've captured where the droplet and water spike are in this configuration. 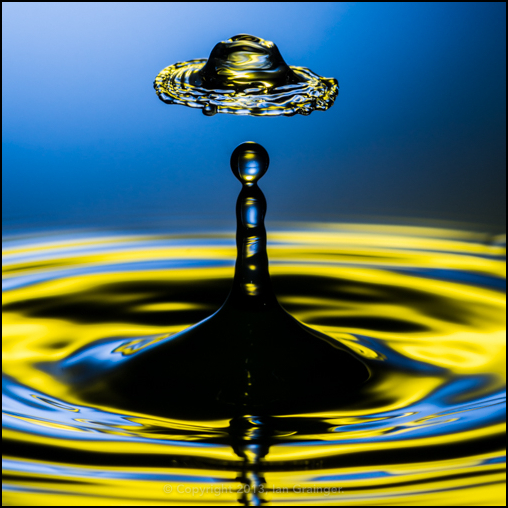 Expansion is more representative of what the majority of my water drop collision images look like. What made this one stand out for me was how the blue and purple blended together, which I found quite pleasing. Hat In The Air is another quite common occurrence when shooting collisions using my method. Again, this one stood out because of the delineation of the colours which seemingly separate to give the impression of a blue background and a yellow water surface. In reality the whole image is showing water surface!! Finally, in Time Stood Still, there is quite a common configuration. 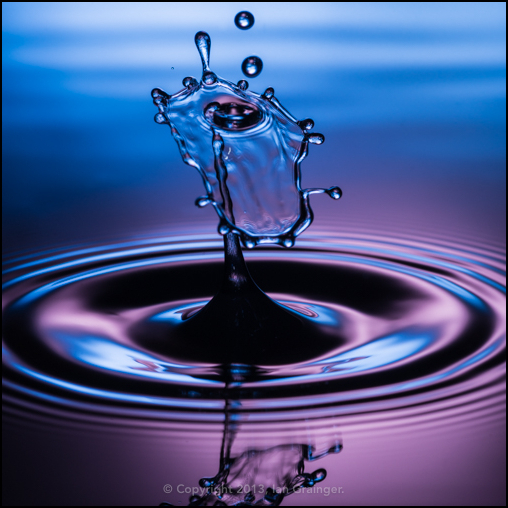 However, with water having seemingly random properties, and timing of clicking the shutter relying more on luck than judgement, I was very pleased to capture the collision, spike, ripples, reflection and falling droplet all in complete sharp focus. Somewhat of a minor miracle I thought!